The Writers Studio Tucson classes meet once a week for 8 weeks at Wellness First! 3861 N. First Avenue Tucson, AZ 85719. For more information, please contact Renee Bibby: 520 591-8795 or renee@writerstudio.com. 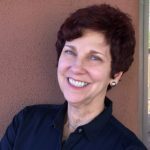 Donna is a fiction writer who has studied and trained to teach at The Writers Studio Tucson, and is passionate about The Writers Studio method. With degrees from the University of Arizona, she is an attorney in private practice. Donna is currently working on a collection of short stories.